Josh Brown| Miami Valley Today Loaded CEO Brandon Freytag sits in his office at his home in Troy watching a few video game streamers that his company represents. 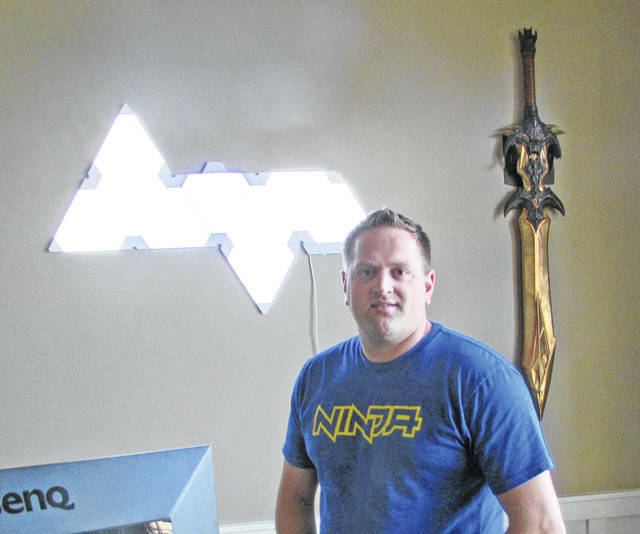 Josh Brown|Miami Valley Today Loaded CEO Brandon Freytag stands in his office in front of his replica Demon Edge sword from DOTA 2, a popular battle arena video game. Freytag’s company, Loaded, represents many of the most successful and popular video game streamers today. MIAMI COUNTY — Sometimes following your dreams involves creating something that didn’t exist before. That’s how Brandon Freytag did it. Freytag, a Troy resident, left his longtime day job doing marketing for Speedway and a lucrative job at video game streaming site Twitch to create his own company, Loaded, a talent and marketing agency that represents the biggest names in live-streaming and eSports today, including gaming influencers like Ninja, DrDisRespect, DrLupo, LIRIK and many more. And while Freytag’s company, of which he is the CEO, now has a staff of more than 20 people working to represent roughly 40 gaming influencers, it was frightening at the beginning, as nothing quite like it had existed before. It all began like most dreams do — playing video games with friends. Freytag graduated from Wapakoneta in 2004, and attended college at Bluffton University, where he studied business administration. He also played for Bluffton’s baseball team and is a survivor of the 2007 baseball team bus crash in Atlanta that killed seven people. Through everything, he continued pursuing his dreams and graduated Bluffton in 2008. Freytag worked with a number of teams, including compLexity and CEVO before creating an eSports team of his own called Loaded. He ran that team as CEO for a team before seeing an opportunity to merge it with a large established team called Evil Geniuses. That was when Freytag moved his family to Troy to work in the Speedway corporate office in Enon. After his successful deal with Monster and bringing other companies like Papa John’s and T-Mobile into the gaming space, Freytag and his Evil Geniuses cohorts saw huge opportunity after opportunity come their way. But again, Freytag was ahead of the curve. “I worked at Twitch for two years, and during that time, I realized that eSports and the gaming teams have all these endorsements — and individual streamers and influencers could have that same opportunity,” he said. “It was starting to happen a little bit but not to a big scale, so I started a relationship with LIRIK and summit1g by sending them donations to get their attention. Those were the first two guys I ever started working with, who both happen to still be some of the biggest streamers on Twitch. And even though the move was a scary one, being unemployed while forming a new company in a field still in its infancy, Freytag had his own representation to help him through. And the big rewards just keep coming. At 2017’s The Game Awards, DrDisRespect won the award for Trending Gamer. And this year, that award has been changed to Content Creator of the Year, and two of the five nominees — Ninja and DrLupo — are represented by Loaded. Tyler Blevins, also known as Ninja, however, continues to be the arguably most recognizable influencer, with almost 20 million subscribers on YouTube and more than 12 million followers on Twitch. He has been featured on the cover of ESPN The Magazine’s eSports issue, and he has appeared on the “Ellen” daytime talk show multiple times, including a charity livestream on Friday where, according to a tweet by host Ellen DeGeneres, he helped raise $52,000 for the Ellen DeGeneres Wildlife Fund. Now there are plans for a New Year’s Eve stream, as well as a soundtrack album called “Ninjawerks” as a partnership with Astralwerks Records, as well as many other opportunities for Ninja and all of Loaded’s influencers. And it all began playing video games with friends back in high school. “You have to be passionate,” Freytag said. “I enjoy every single day, getting on my computer and going to work, being a part of this scene. We can shape and mold the industry to some degree. We can set the trends. 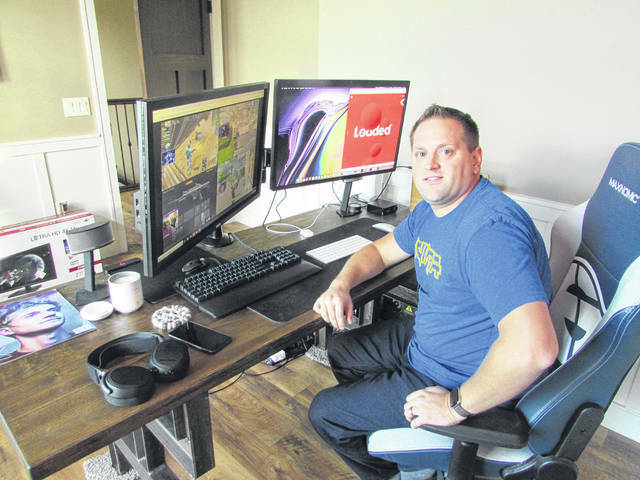 https://www.dailycall.com/wp-content/uploads/sites/30/2018/11/web1_111918jb_brandonfreytag_alternate-2.jpgJosh Brown| Miami Valley Today Loaded CEO Brandon Freytag sits in his office at his home in Troy watching a few video game streamers that his company represents. https://www.dailycall.com/wp-content/uploads/sites/30/2018/11/web1_111918jb_brandonfreytag-2.jpgJosh Brown|Miami Valley Today Loaded CEO Brandon Freytag stands in his office in front of his replica Demon Edge sword from DOTA 2, a popular battle arena video game. Freytag’s company, Loaded, represents many of the most successful and popular video game streamers today. Contact Josh Brown at jbrown@aimmediamidwest.com, or follow @TroyDailySports on Twitter.